The Flower Power Tea Room in Besant Nagar is straight out of an Enid Blyton book, complete with high tea, scones with lashings of cream, and a floor to ceiling wall decked with flowers. Your Instagram feed is going to look so good! When you first walk through the doors of Flower Power Tea Room (tucked away on a street near Elliot’s Beach), you might find yourself being transported to a different world. On the right side, there’s a wall of flowers – floor to ceiling – a perfect spot for selfies and other group photos alike. While on the left side, there is an open wooden cabinet where teacup sets are on display – and on sale. Further inside are tables set with fresh flowers and chairs with adorable cushion seats so that you don’t mind spending your whole day sitting there and sipping on a cup of tea. Try their traditional English style afternoon tea (High Tea) with a selection of finger sandwiches (both vegetarian and non-vegetarian), freshly baked scones (with homemade strawberry jam and clotted cream) and adorable mini cupcakes. This along with a pot of tea of course; it costs about INR 500 for one person. There’s also Dessert Tea (that has everything except the sandwiches) at a price of INR 350 for one person. They typically require a 24-hour reservation notice for High Tea so make sure to let them know in advance. Their menu is vast and could take you a while to go through; each tea comes with a proper explanation, in terms of what you can expect from the aroma, the taste, and the full experience. There’s Lavender Earl Grey Tea (that has bergamot and lavender) and Mountain Rose Tea (jasmine, rose and cardamom) just to name a couple. Once you’ve perused the tea menu, move on to the cakes. They have popular choices like Chocolate Cake and Carrot Cake, but they also have a Victoria Sponge Cake which cannot be missed. 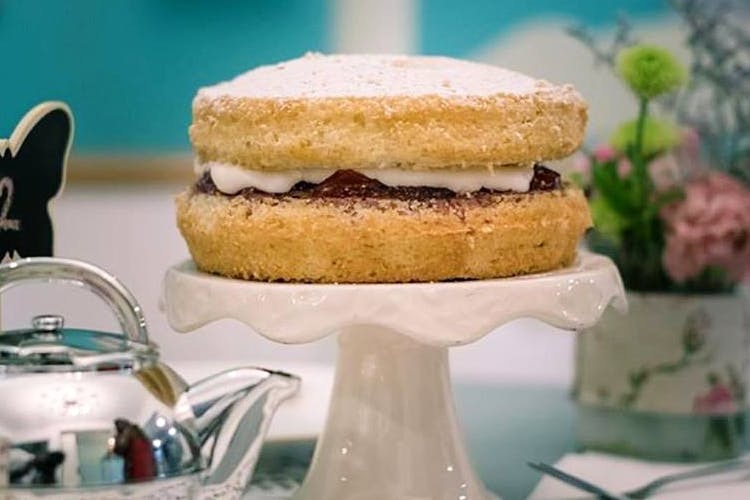 The Victoria Sponge Cake comes in a slice or as a mini cake – which is made of two layers of sponge cake sandwiching a layer of jam and cream between them. Drool. Their food menu continues to expand with sandwiches and all-day breakfast being added – which can be found on the blackboard near the counter. If you need help, ask the staff and they’ll guide you on good pairings too. They’re also available for private hire for parties, events, and meetings (Mondays – Wednesdays, and Sundays).